Tucson Chamber Wants Image Change: What Will Become of the ‘Old Pueblo’? “Tucson has a choice,” the chamber’s board Chairman Kurt Wadlington and CEO Mike Varney wrote in the program for the chairman’s lunch. Most of the story is dedicated to marketing and business types making the case for dumping the “Old Pueblo” because it’s an “archaic marketing motto”. More on the nickname controversy after the jump. “We can embrace the historic nickname that has served us for more than a century while still energetically moving forward to promote prosperity and change,” said Pima County Administrator Chuck Huckelberry. “I am not particularly concerned about what we call ourselves. I am more interested in how we perform as a community. I am not generally one to agree with the Chamber of Commerce or Huckelberry, but on the “Old Pueblo”… eh? In the past, I have complained about the old Metropolitan Convention and Visitors’ Bureau (now Visit Tucson) selling Tucson as cowboys, cacti, and sunsets and ignoring the art, music, culture, and progressive values our city offers. I’ve also suggested dumping our archaic logo– which, thank God, no longer has lasso around the mountains and the saguaro– but it’s still pretty stodgy and still has a saguaro. I kind of don’t care about the “Old Pueblo” nickname, but I don’t support hiring a marketing crew and spending thousands of dollars to rebrand the city, and the idea of a community contest, as suggested in the article, is stupid. According to the Star, that’s how we got “The Sunshine Factory” as a nickname in the 1980s. 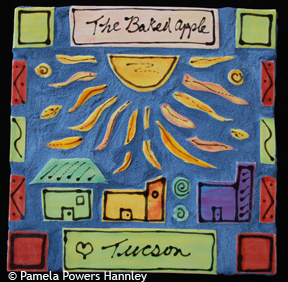 Personally, my favorite nickname is “The Baked Apple”; it was often used by Tucson Weekly editorial writers in the 1980s. But even with Tucson’s hipster edge, it is also as a place where history and culture are embraced– which is why I agree with Huckelberry. The Star article ends with some past Tucson nicknames and slogans that have come and gone. The “Old Pueblo” outlasted all of the marketing-slogan nicknames. I think that is a message for the Chamber of Commerce. Next articleThe spawn of Satan to run for the senate? They haven’t been debunked a all. The average comp level is the cost. These are enormously expensive pensions and taxpayers have to bear them. Thucydides, you’ve been drinking the Sal DiCiccio tea . . his ‘numbers’ re: City of PHX employees have been debunked time and time again. You do yourself no favors by posting inaccurate and skewed-to-your-own-end ‘studies’. Response to Movingforwardaz. In quality measures, only excellence counts. Phoenix is at 14 percent, the lowest excellence rating of any major city in Maricopa county. Same survey you are quoting. There is another word for the levels of service you are quoting: mediocrity. And, they are significantly short of being 100 prrcent mediocre. Are you kidding? Misrepresenting the facts to support RW rhetoric doesn’t fly here. This is not the comments section of AzCentral.com. The Arizona Legislature withheld millions of dollars from Tucson and Pima County. That’s a fact. When your budget is arbitrarily reduced by that amount, it hurts… kinda like a slow starvation. Cash starved cities? The typical employee moving from a state job to a city job receives a 40% raise. The City of Phoenix compensation package averages over $100,000 per employee for the entire city. You could run an excellent city with half that compensation package, literally. And, City of Phoenix does not run an excellent city. Only 14% (Behavioral Research Center) of Phoenix citizens give City of Phoenix services an Excellent rating. The surest way to kill a bad product is to advertise it. Only 7% of parents (National Research Center) rate Tucson an excellent place to raise a child. Since Tucson policy is set by Democrats, Tucson is a Democrat product. Phoenix isn’t much better (12%) but it has suburbs where 35 to 40 percent of parents rate their neighborhood an excellent place to raise a child. Tucson suffers from having a major research university. All such universities plague their local communities because professors like their governments fat and expanding. Professors are also curiously siloed, quite uninformed about what it takes to make government effective. When you drive into a city, you can immediate judge the effectiveness of a city government by examining the pavement as you drive. If city government is focused on the common good, it maintains its pavement fairly close to engineering standards, knowing that to fall behind on those standards is like borrowing from a loan shark at 24%. Tucson’s pavement condition is horrible, especially in its minority and low income communities. Drive down 12th avenue from 44th street to Irvington. What an embarrassment. You can also determine the quality of city government by how long the graffiti stays up. Graffiti doesn’t make nightfall in well run cities. Some Graffiti on the south side of Tucson has been up for years.